His early teaching appointments were as adjunct faculty: at Cambridge University, Magdalene College would not pay a salary for Richards to teach the new, and untested, academic field of English literature. Instead, like an old-style instructor, he collected weekly tuition directly from the students, as they entered the classroom. In his private life, Richards married Dorothy Pilley in 1926; they had met on a mountain climbing holiday in Wales. IV. the Times of India Guide to Basic English (1938) developed the Basic English program in effort to develop an international language, an interlanguage based upon a vocabulary of 850 English words. I. A. Richards' developed the principles of New Criticism is in two books of critical theory, The Principles of Literary Criticism (1924) and Practical Criticism (1929). The first book, The Principles of Literary Criticism, discusses the subjects of form, value, rhythm, coenesthesia (awareness of inhabiting one's body, caused by stimuli from various organs), literary infectiousness, allusiveness, divergent readings, and belief. 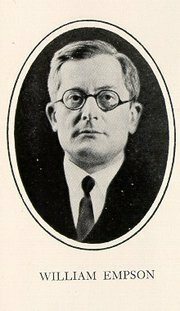 He starts from the premise that “A book is a machine to think with, but it need not, therefore, usurp the functions either of the bellows or the locomotive.” His second book, Practical Criticism (1929), is an empirical study of inferior response to a literary text. I. 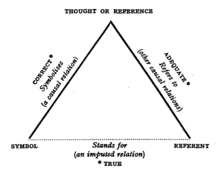 A. Richards and C. K. Ogden created the semantic triangle to deliver improved understanding to how words come to mean. The semantic triangle has three parts, the symbol or word, the referent, and the thought or reference. In the bottom, right corner is the Referent, the thing, in reality. Placed at the left corner is the symbol or word. At the top point, the convergence of the literal word and the object in reality; it is our intangible idea about the object. Ultimately, the English meaning of the words is determined by an individual's unique experience. At the age of 75 years, I. A. Richards was approached by the Saturday Review to write a piece for their "What I Have Learned" series. Richards surprisingly took this opportunity to expound upon his cybernetic concept of "feedforward". The Oxford English Dictionary records that I. A. Richards coined the term feedforward, in 1951, at the 8th annual Macy Conferences on cybernetics. In the event, the term extended the intellectual and critical influence of Richards to cybernetics which applied the term in a variety of contexts. Moreover, among Richards' students was Marshall McLuhan, who also applied and developed the term and the concept of feedforward. According to Richards, feedforward is the concept of anticipating the effect of one's words by acting as our own critic. It is thought to work in the opposite direction of feedback, though it works essentially towards the same goal: to clarify unclear concepts. Existing in all forms of communication, feedforward acts as a pretest that any writer can use to anticipate the impact of their words on their audience. According to Richards, feedforward allows the writer to then engage with their text to make necessary changes to create a better effect. He believes that communicators who do not use feedforward will seem dogmatic. Richards wrote more in depth about the idea and importance of feedforward in communication in his book Speculative Instruments and has claimed that feedforward was his most important learned concept. ^ Bizzell, Patricia; Herzberg, Bruce (2001). The Rhetorical Tradition: Reading From Classical Times to the Present (2nd ed.). New York, NY: Bedford/St. Matin's. p. 1270. ISBN 0312148399. ^ Tai Huai-Ching, On the Study of Words (1960).my World Publishing Co. p. 149. ^ "A quote from Principles of Literary Criticism (Routledge Classics)". www.goodreads.com. Good Reads Inc. 3 August 2012. Retrieved 12 April 2019. ^ Glicksberg, Charles I. "I. A. Richards and the Science of Criticism." The Sewanee Review 46.4 (1938). JSTOR. Web. <https://www.jstor.org/stable/27535493>. ^ Hochmuth, Marie. "I. A Richards and the ‘New Rhetoric’ new royal”, Quarterly Journal of Speech 44.1 (1958): 1. Communication & Mass Media Complete. ^ a b "The Meaning of Meaning of I. A. RIchards" (PDF). Archived from the original (PDF) on 29 October 2013. ^ a b "The Communication Blog".